I'm a big Donna Brazile fan. So you can imagine my excitement when I heard she would be the guest speaker at a Washington Women Lawyers Awards Dinner that I was attending. Thanks to the swift shipping of Amazon.com, I had two copies of her book Cooking with Grease: Stirring the Pots in America, a memoir of her life in politics, in my hands the next morning, ready for Tracy and I to have signed later that night. 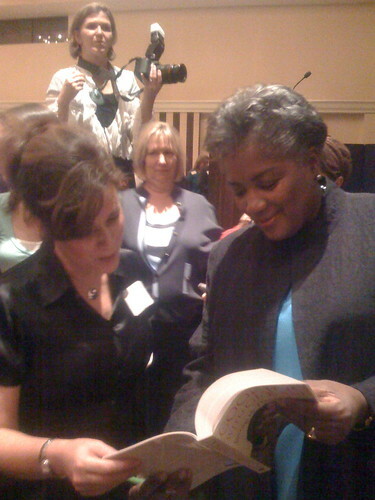 As I introduced myself to Ms. Brazile, I said, "I'm actually not an attorney, I'm a food writer." Clearly being a food lover herself (each chapter of her book is named after a New Orleans food), she flipped towards the back of the book and showed me her late mother Jean's recipe for seafood gumbo. "I'm talking gumbo with Donna Brazile!" I was screaming like a twelve-year-old inside my head. There's a lot of chopping and prepping involved in gumbo, so Jean would divvy up the tasks among her nine children. Who needs a Cuisinart when you have nine kids as your prep chefs! I bet they also made for some lickity split clean up too. 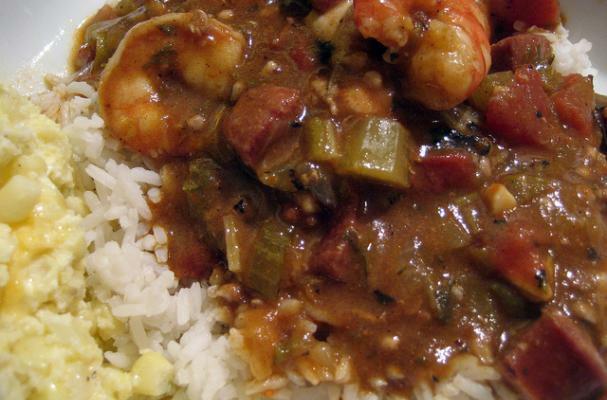 This last Saturday we hosted a dinner party and spent the afternoon making Jean's gumbo. As Ms. Brazile recommends in Step 1 of her cooking instructions, "Pour yourself something cold...You're about to cook with grease." Out came the wine and the Dr. John. Many shrimp, oysters, sausages, glasses of wine, and much stirring-and-browning-of-the-roux later, we dished up the gumbo sat down w our nine guests. Then we raised our glasses and toasted the stirring up of America's pot. Damn, that gumbo was good. Get Jean's Seafood Gumbo recipe here. Nice close-up of the gumbo.